The Education Division, Taipei Economic and Cultural Office in Boston, held an orientation for students who received the Taiwan Scholarship Program (TSP) and Huayu Enrichment Scholarship (HES) on July 28, 2015. Ms. Cynthia Huang, Director of Education Division, presented the scholarship certificates to the students. Ms. Huang encouraged the recipients to explore Taiwan’s rich cultural tradition and to experience Chinese festivals, such as the Lunar New Year, and suggested brushing up on Mandarin listening and vocabulary through Taiwanese TV shows and dramas. The Education Division also offers a “Study in Taiwan” handbook which includes instruction on visa requirements and serves as a handy reference to assist students to become well-prepared to visit Taiwan. The Education Division invited Stella Wan who was the HES recipient last year to share her Mandarin learning experience in Taiwan. She was awarded the “Taiwan Scholarship Program” this year to pursue a degree program in Taiwan. The Taiwan Scholarship Program and Huayu Enrichment Scholarship are sponsored by the Ministry of Education, Republic of China (Taiwan) to encourage outstanding international students to undertake degree studies or Mandarin language courses in Taiwan. Scholarship guidelines are announced in January and the application deadline is in March. In 2015, four students were awarded the Taiwan Scholarship and thirteen students received Huayu Enrichment Scholarship from across New England. (Left to right) Stella Wan, Arianna DeMinico, Cynthia Huang, Director of Education Division, TECO- Boston, Justin Kwan, Greyson Lewis and Frances Brittingham. 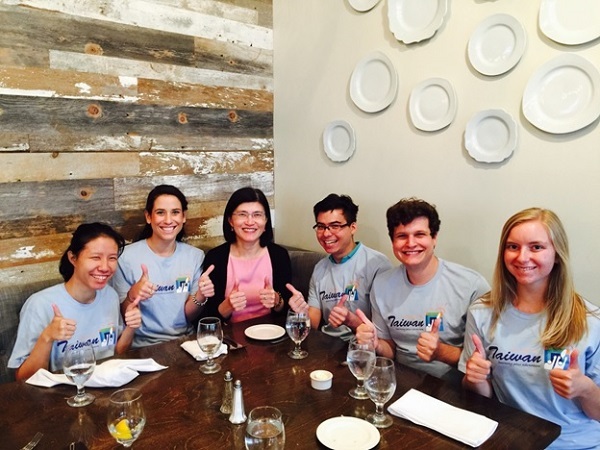 Awarded recipients proudly display their “Study in Taiwan” T-shirts.